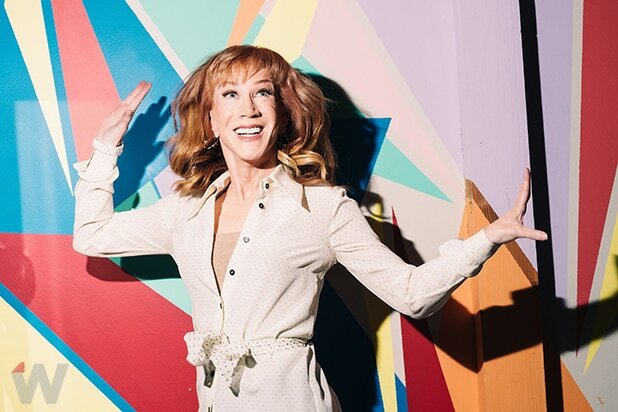 Talk to any reporter who’s ever interviewed Kathy Griffin and they’ll tell you the hardest thing about it is keeping a straight face. Griffin, who is receiving the Vanguard Award from the San Francisco Gay Men’s Chorus on Sunday for her LGBTQ advocacy, had TheWrap’s newsroom in stitches from the moment she walked into our studio. And she kept on going for the entire interview, insisting that she has no problems calling the leader of the free world “an idiot,” as she told MSNBC’s Chris Matthews during a recent interview. Griffin then went for the kill: “And he made them say, ‘Nastrovia!” referring to the Russian cheer used to thank someone for meal or a drink. For the record: The “golden showers” allegations that Griffin is referring to have been flatly denied by Trump, and have not been substantiated. They were included in an unverified dossier released by Buzzfeed in January. The dossier does not accuse Trump of urinating on anybody. Griffin is a comedian.